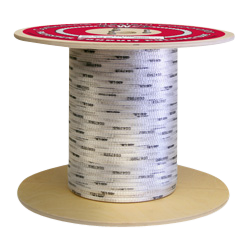 Designed for the telecommunications and power utility industries, polyester conduit pulling tape is the preferred choice for underground measuring and pulling of fiber optic and other lightweight cables. Sequential foot markings allow for accurate measurement while flat construction and specially formulated lubricants work to minimize friction and duct cutting. Resists mildew growth.